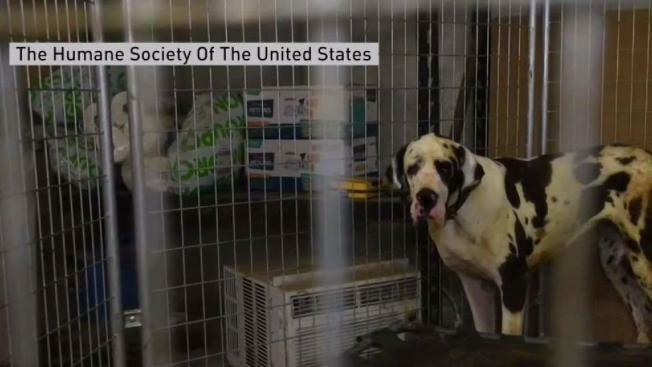 Dozens of Great Danes found living in squalor inside a New Hampshire mansion are being held as evidence in an extensive animal cruelty case. “If you looked at the outside of this home you’d have no idea what was happening behind closed doors,” said Lindsay Hamrick, the New Hampshire State Director of the Humane Society of the United States. Inside the 15,000 square-foot Wolfeboro mansion, authorities found 75 Great Danes, from puppies to adults, living in deplorable conditions. They found nine more puppies at a nearby property. “When we walked in, the smell of ammonia was so overwhelming and there was waste and feces all over the house, on the walls, it was just really heartbreaking,” Hamrick said. Because of the number and especially the size of these animals, the Humane Society of the United States was called in to assist local authorities in Friday’s 14 hour rescue. Wolfeboro Police charged Christina Fay, 60, with two counts of misdemeanor animal neglect. Officials said she was selling the Great Danes online for $2,500. “By all accounts on her website these animals were well cared for and that’s not what was happening in reality,” Hamrick said. The dogs are now being taken care of at an emergency shelter and will eventually be available for adoption once the case is closed. The investigation is ongoing and authorities said Fay will likely face additional charges.